Putting a price tag on your watch hinges on multiple factors, including its availability, condition, age and manufacturer. Your watch's real value depends on how much someone else is willing to pay for it. However, if you want to sell or insure your time piece, you can research it to get a ballpark figure. Make note of your watch's brand name, model, age and condition. Use a jewelry or watch price guide to find its current market values. Prices will vary. Watches with flaws, for example, will have a lower value. Search online for price guides and appraisal information specific to your watch type and brand. 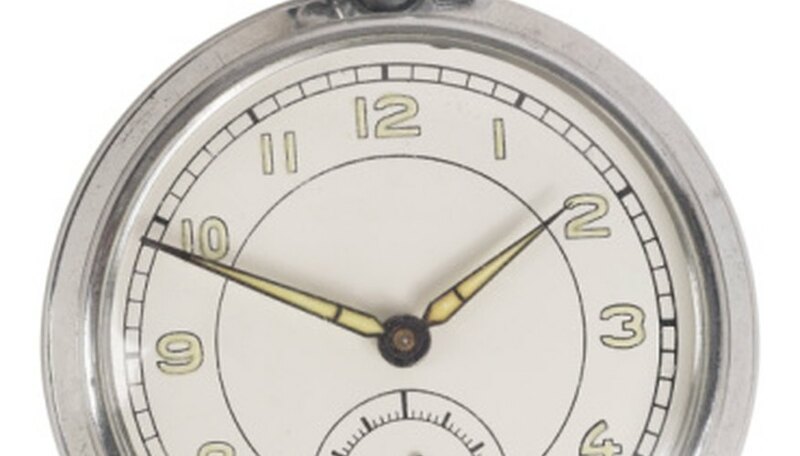 One website may offer details on new watches, for instance, while another site focuses on vintage pocket watches. Check eBay's website to find current value ranges for your watch. Browse eBay's completed auctions to see what prices people are willing to pay for similar watches in the same condition. Schedule an appointment with a professional jewelry or watch appraiser at a reputable antique or watch store. For a fee, a professional will provide you with a value for your watch, as well as an appraisal certificate. Search auction houses, such as Christie's and Sotheby's. Find completed auctions for your watch and check the price ranges paid. Auction houses often will send you a catalogue for a fee.